While performing our day to day tasks at the computer system, it happens quite often that we need to copy or cut and paste the text, images, website addresses, etc repetitively. If you’re using the default Windows clipboard you may need to cut/copy data again and again and this is expected to take a lot of your valuable time. But, now you can reduce this burden just by trying out Swift Paste 2.1. It’s an effective clipboard tool that supports storing multi-clipboard texts and images that you can paste to any focus window. It allows storing text, images, email, websites address, passwords, and other info, which you can paste anytime required. It stays at top of the screen and you simply need to click the clip once and it would be pasted to the focus window. One of her best features of the application is password protection that helps in saving your data from being accessed by others. Swift Paste 2.1 is compiled of small and pleasing interface and comes loaded with a self explanatory feature-set. The program is easily usable and provides different options on the menu bar. When you launch the application, you need to set a new user account with the application by entering a desired username and password. Logging-in you get the menu bar placed at the top of the window/screen. The Manage option presents the features like change username, change password, organize data, import data, export data, options, and others. ‘WinClipboard’ contains cut/copy options with recent copied clips, text, etc. 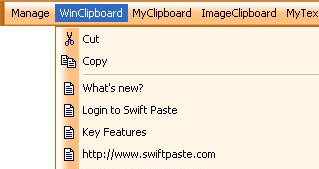 MyClipboard provides options to cut and copy text, and ‘Image Clipboard’ supports cut and copy image features. With the ‘MyText’ and ‘MyImages’ options you can add text and image or folders of text and image to store the relevant data you need to use repetitively. Just click and paste, and save lot of your time. Swift Paste 2.1 program makes it possible for you to insert any text or image into focus window, as many times as you want without the need to copy them again. The rating of 4 points is assigned to the application for the easy-to-navigate set of options and overall stellar performance.